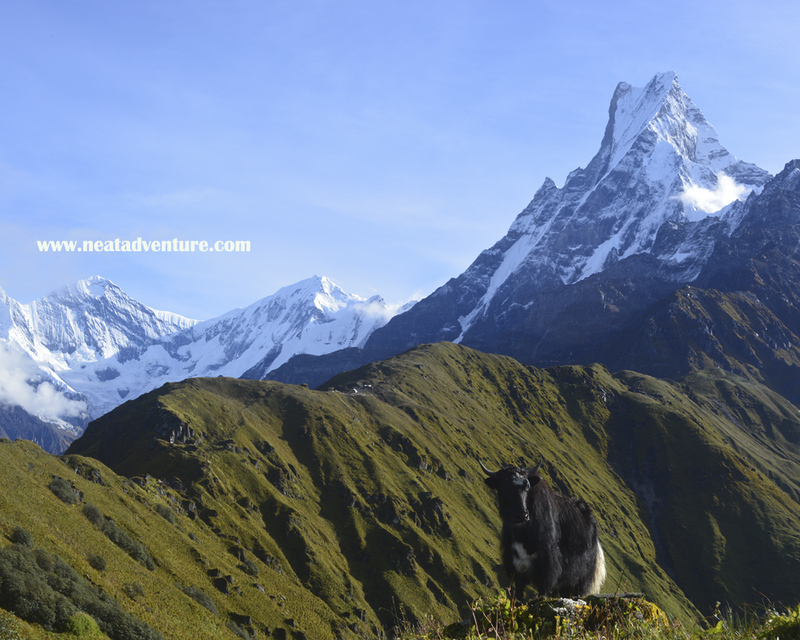 Mardi Himal Trek or Fishtail(Machhapuchhare) model Trek is one of the most beautiful trails and less explored routes in Annapurna region with exotic scenery of Himalayas, rhododendron forest, hills, mountains and amazing people. This trail is also a newly established trail and quickly accessible to the Himalayas with in a few days- could be a good choice for those trekkers with limited time. One can enjoy a spectacular view of Fishtail()Machhapuchhare, Mardi Himal, Annapurna South, Annapurna I, Huinchuli, and Ganga purna after reaching Mardi Himal High Camp. 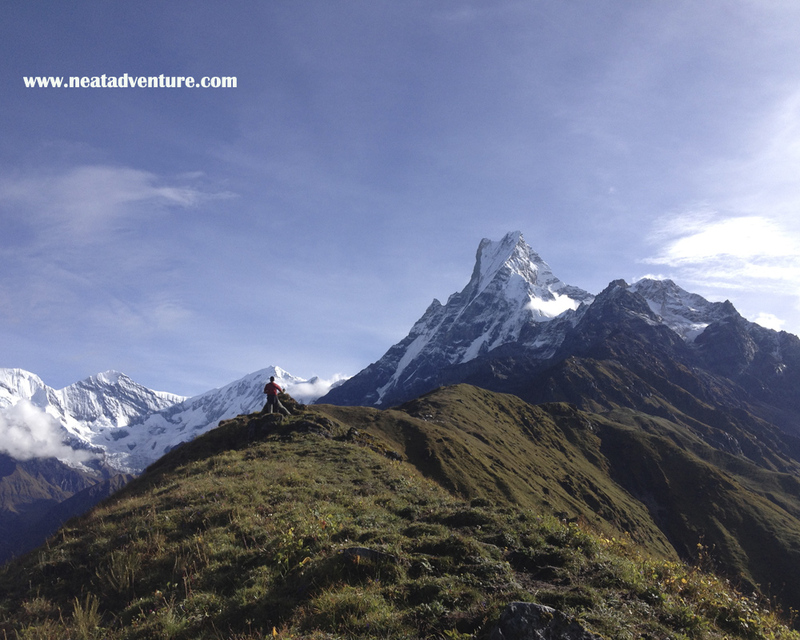 Infact, the trek is very popular with the trekkers for the perfect view of Fishtail(Machhapuchhare) Mountain 6990m. Although, the trek can be started from many points, one of the recommended could be drive to Khande from Pokhara, which is about one hour drive. Your trekking begins from Kande. At this day, you will hike trek uphill trail about 2 hours to Australian Base Camp 2060m.,easy Nepali flat(easy up and down trail) to Pothana 1950m. (40 minutes from Australian Camp) and to Deurali 2100m. (an hour from Pothana) also depending upon how good you can walk. Ahead from Deurali, there are no any villages or settlement and only limited camps for the tourist. The second camp could be forest Camp 2600m. ( 3-4 hours from Deurali), Low Camp 3050m. (2-3 hours from forest Camp) or if you are a good walker then you can make it to High Camp 3900m. (2-3 hours from low Camp) in a same day. Ascending upward through the rhododendron forest with amazing views would be your company to overcome your tiredness and hard effort. High Camp itself is a Shangri-La with mezmorising views of mountains, hills, valleys and rivers. The next morning before the sunrise, you could hike to the Mardi Himal Base Camp (4500m) to see a better view of mountains and glaciers. It is about 3 hours steep walk but totally worth it. After enjoying panaromic view from Base Camp, you will have to come back to high camp again. Here, you might want to grab a lunch and decend to low Camp or you might want to spend one more day to relax and enjoy the nature. From the High Camp, You can descend directly to Sidhing village.(1700m.) 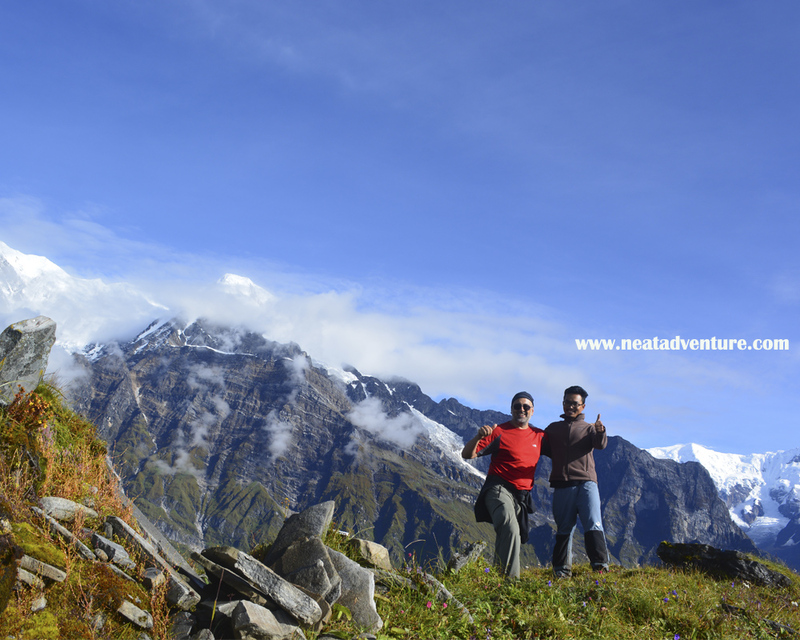 or you can further continue other treks like Annapurna Base Camp or Poonhill Trek. You could camp at Sidhing, there are some homestays and guest houses to stay. The very next moring, you can hike about one and half hours to reach Ghalel Village to catch a jeep to Pokhara. Flight/Drive from Kathmandu to Pokhara: Take a flight/bus/hire a private car from Kathmandu to Pokhara. The flight will take about 25-30 minutes where as bus will takes 7 hours including some lunch breaks even though it is only 200km distance. Taking a flight or hiring a private car will saves your a lot of time to explore around Pokhara. Pokhara to Deurali: Early morning after breakfast, drive to Kande, which is an approximately 1:15 minutes. Then, start your hike to Australian Camp (1600m), which is about 2 hours uphill hike passing through villages and forest. Further continue your trek to Pothana, which is an easy walk through jungle, and then reach to Pitam Deurali (2100m). Deurali to Forest Camp/Low Camp: The trek will gradually starts to gain altitude from forest Camp (2600m) which is about 3 hours hike through forest, lunch at forest camp. There are no any teahouses in between forest camp and Deurali. 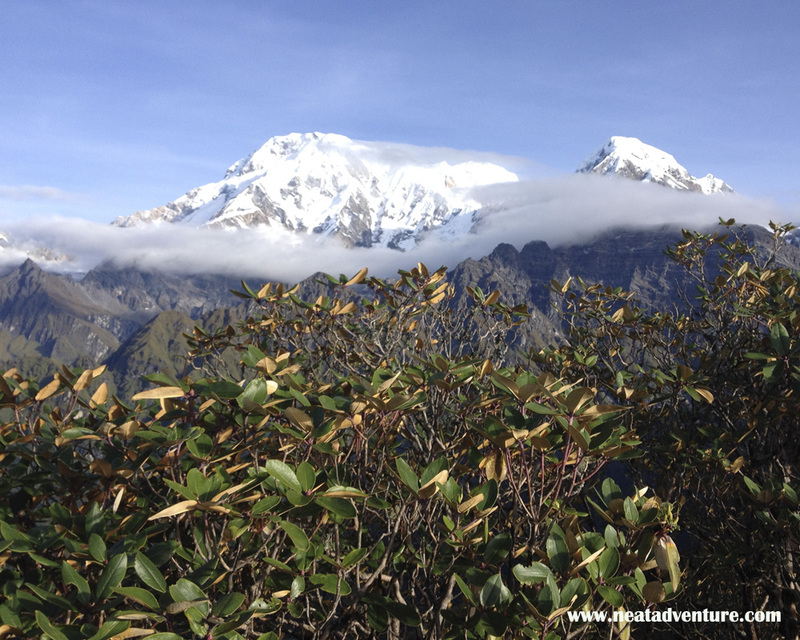 If altitude is not a problem with you then can further continue to Low camp, which is approx. 2 and half hour ahead. Low Camp to High Camp (4500m): After an hour hike, soon the trees will start to turn into bushes and onto an open ridge with spectacular views of mountains. About two more hours walk will take you to High camp where you can stay an night at teahouses. Sidhing to Pokhara: From Sidhing, hike about 1 and half hour to Ghalel village and Catch a local jeep to Pokhara. Trekking guide are very responsible person who will assist you in your whole trek. 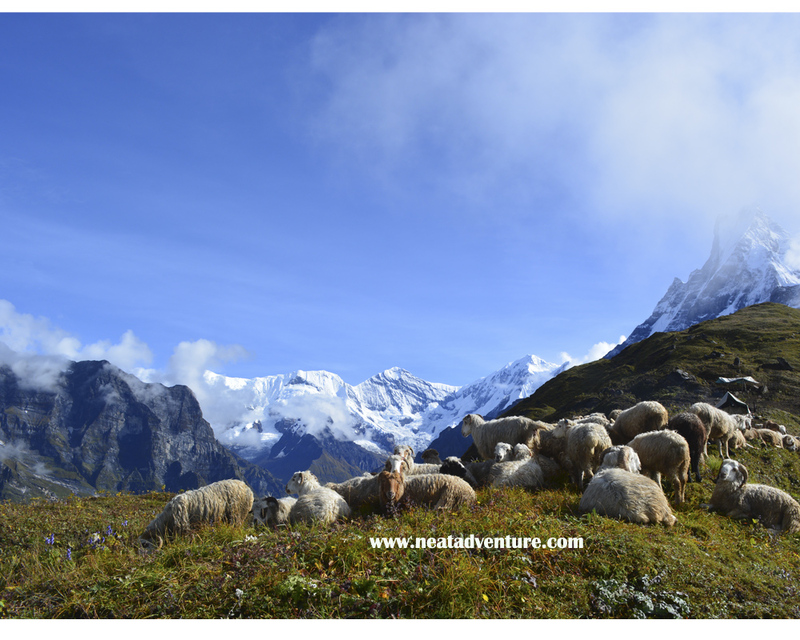 They have a very broad knowledge about geography, Flora, Fauna, culture, himalayas and trails. 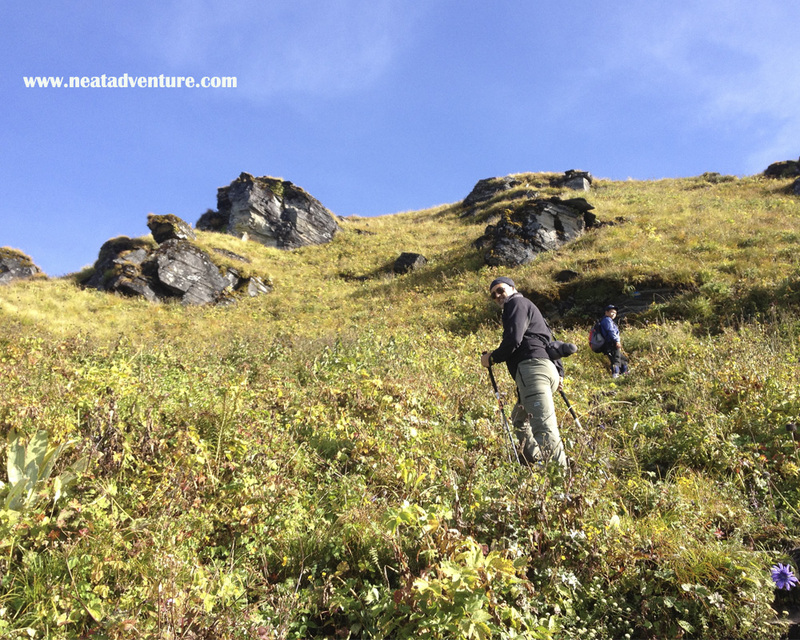 Trekking guide will assist and brief all your questions and confusion during trek. The company will provide you the best and authorized guide to make your holiday. Potters are very strong and poor Nepali people who will carry all your baggage where ever you go. Don’t Forget to tip them for their service . Mardi Himal Base Camp 4500m.